Home » Games » World of Warcraft Graphics Upgrade? Is It Time? Is It Needed? Do you think that a World of Warcraft graphics upgrade is needed? I was recently talking with a friend about the potential requirement for this and thought that this would make for an interesting discussion here too! He was basically saying that having looked at the other major MMORPGs on the market, most of them have had graphical updates to their game engines in the last year. By doing this the developers hope to extend the life of the current game by keeping existing players and potentially gaining new ones off the back of the improved graphics, however, I wasn’t convinced that Blizzard would be taking the same approach with World of Warcraft. WoW has a very distinctive, stylised look to its graphics engine which is quite possibly one of the reasons for the huge number of subscribers that are currently playing the game – around 10 million people the last I heard! Those are huge numbers, an awful lot of which I’m sure are playing because WoW runs perfectly well on their older computers – playing WoW actually saves them money because they don’t have to upgrade their computer to play it! Plus it means that you can easily play it on your laptop when you’re away from home or even on your HTPC as I have recently done – sit back on your sofa and play WoW on the big-screen TV! 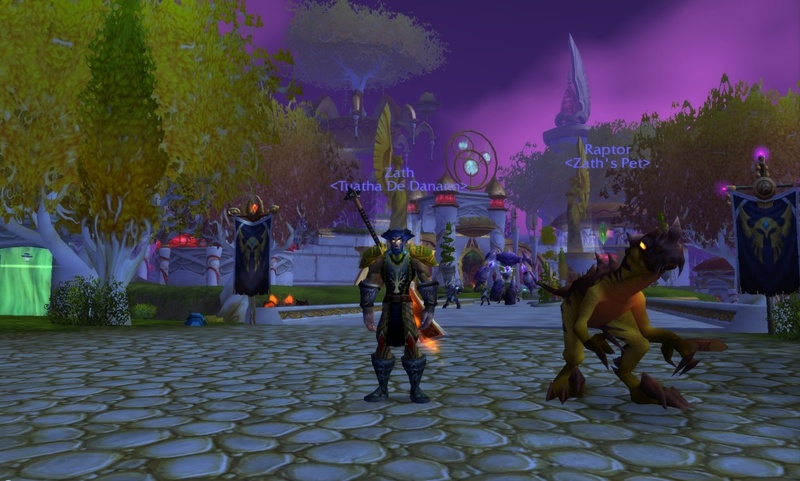 Before I started playing WoW, I used to think that the graphics weren’t very good – they couldn’t have been…surely, the game had been out for 2 years when I eventually started playing – however, once I did get talked into giving the WoW trial a go (by the same friend I mentioned earlier) I really started to appreciate the rather cool looking style of the WoW graphics. I’d played Everquest 2 just before that and more recently Age of Conan, both of which have pretty demanding photo-realistic graphics engines, which means you need a “beast” of a computer to play them and they just don’t have the same ‘fun’ element and character that the WoW graphics have. Having read that Blizzard will be improving the graphics over time, but in their own way, I think this approach will probably be for the best, rather than having a huge overhaul which could take huge amounts of development time and resources, by doing it in stages with their expansions they can focus on ensuring the gameplay doesn’t suffer from them being distracted by going back and changing the entire games graphics in one go. If you read the recent articles over at VideoGamer.com, particularly the Wrath of the Lich King preview interview with Blizzard in which say that a graphical reboot of WoW may never be necessary. You can definitely tell that Blizzard like the fact that their game has relatively low computer system requirements and see that as a strength, so as much as I’d love to see WoW graphics that look just like the cinematic intro videos, I don’t really think we’ll be seeing that kind of upgrade any time soon. In the meantime, I’m still looking forward to seeing minor improvements in terms of lighting, textures and shadow effects that will be contained within the Wrath of the Lich King expansion. You can compare the quality of the in-game graphics as opposed to the cinematic intro sequences for yourself by taking a look at the Wrath of the Lich King trailers. If you are interested in getting this expansion, here’s the best WoW: Wrath of the Lich King pre-order price I’ve found. You can also take a look at the videos below and see just how big of a change the development of the World of Warcraft graphics have gone through over the years. How important are graphics to you in a game? Particularly in an MMORPG such as World of Warcraft? Do you appreciate the fact you can play on a system that doesn’t need to a state-of-the-art high-end gaming system?